Restless Chipotle » Earl Grey Chocolate Thumbprint Cookies: Easy to Ship! Earl Grey Chocolate Thumbprint Cookies is a quick and easy cookie recipe that ships well. A butter cookie is filled with a pool of dark chocolate flavored with citrusy Earl Grey tea. When I was growing up we called these Brown Eyed Susans. This recipe and images have been updated from the original publishing date, November 2009. I’m leaving some of the original story because it’s a nice memory for me. Imperial Sugar partnered with Restless Chipotle and #Choctoberfest to bring you the 2016 update of this post. If you are in a hurry click here to go straight to the chocolate thumbprint cookies recipe. These are one of the types of cookies I sent to Chris in the Middle East a few weeks ago. They took nine days to get there and he said that they were great, unbroken and still very fresh tasting. They are based on one of the recipes in my Everything Cookies and Brownies Cookbook. Chris is a big tea drinker. All of my kids are. He likes all kinds of tea. I wanted to make something a bit different, and wanted to stay away from dairy fillings so I used this recipe (which calls for water in the filling) and used a strong infusion of Earl Grey instead. So much has changed in the past seven years! When I wrote the original post I had just separated from my first husband and was in the midst of a life crisis. You know, the kind where your whole world turns upside down and everything in your entire universe is shaken to the core? During that horrible period of time I lost all but two of my friends, had to leave my church, and had no idea how I was going to provide for the kids. Reading these old posts takes me back to that time, reminding me how I was writing as if everything was normal and yet I was broken inside. Only a few people really knew what a struggle it was. On Sunday our Pastor talked about how you may be living in Saturday but Sunday’s coming. He was talking about how the apostles must have felt the Saturday after the crucifixion. Angry, frustrated, anxious, defeated… they didn’t know that a miracle was just a day away. Ever Go Through Something Similar? The period of time from late October to late November 2009 was like that for me. It was short but very intense. I felt like God let me down, like He was laughing at me. I had spent 30 years being the “Proverbs 31” wife and in the end everything fell apart. Surely that wasn’t the way it was supposed to work! My blog was not making thousands of dollars a month. I had a few freelance clients. My ex had left me with all the bills, no money, and 6 kids under the age of 18. He didn’t even pay child support until the state went after him (finally got my first payment in August 2010). I had nothing to offer, no way to support myself and the kids. Worst of all, good Christian women did not divorce their husbands they stayed and prayed. I was all prayed out. Obviously I was not a good Christian woman. It was definitely the Saturday of my soul. I look back on that now, knowing that I was being led into a life I could never have imagined — something so much better than anything I’d had in my adult life. I struggled with my faith, with my confidence in God and my confidence in myself but in the end I came through it stronger, more grounded, deeper, and more willing to let God out of that church box we tend to try to keep him in. I’m happy. Really happy. And content. And, if you are in the midst of one of those types of periods in your life I can tell you that you’ll come through it. Really. You haven’t missed God and He doesn’t hate your guts. I actually have about 200 posts from 2007-2009 that are sitting here on the blog but unpublished. Every once in awhile I pull one out and go ahead and reshoot it and update the recipe. This is one of those. 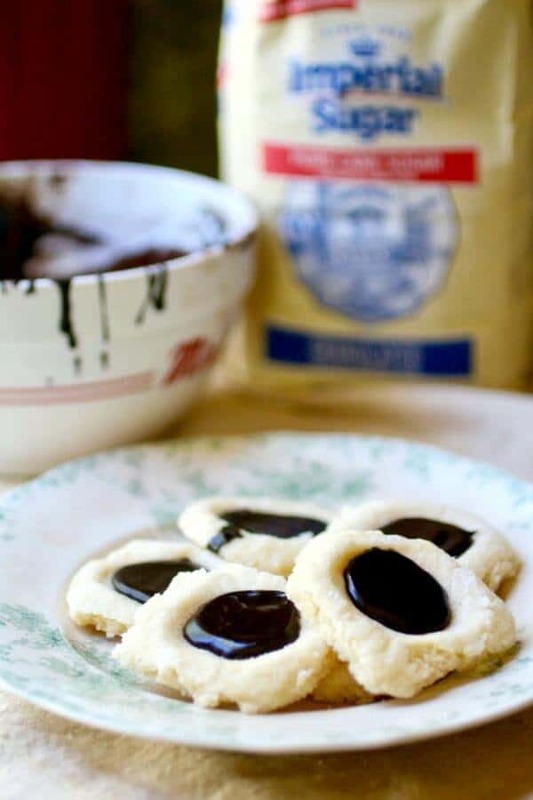 Chocolate Thumbprint cookies have been around a long time. I got the inspiration for this recipe from a late 1930’s era cookbook. I’d never seen a thumbprint recipe that called for the filling to be made out of cocoa and confectioner’s sugar but once I made them the first time I fell in love. The centers firm up so that you can pack them without worrying about the middles melting or smearing. They also stay really shiny, which I think is pretty. The butter cookie part is not overly sweet so you get that buttery, crumbly cookie and then a blast of the cocoa. Finally, there’s just a slight finish of the Earl Grey – floral and citrus. The dough for the chocolate thumbprint cookies is rolled in sugar before baking. I like to use colored sugars when making these for the Holidays. They’re definitely similar to these peppermint blossom cookies. I just want to thank Imperial Sugar for sending me 40 pounds (yep, 40 pounds) of sugar to get me through #Choctoberfest. I can honestly say that I have used nothing but Imperial sugar my entire life. This is a brand I trust and I prefer to use pure cane sugar as opposed to those other sugar that came from sugar beets or whatever. They’ve got great information and recipes on their Imperial Sugar website, or follow them on Facebook, Twitter, Instagram, or Pinterest. Enter now to win our #Choctoberfest 2016 prize pack! We’ll be picking a winner at random winner on Saturday, Oct. 22. Enter by next Friday to make sure your name is in the drawing! Here’s the Earl Grey Chocolate Thumbprint Cookies recipe. It’s fantastic at a Christmas cookie exchange! 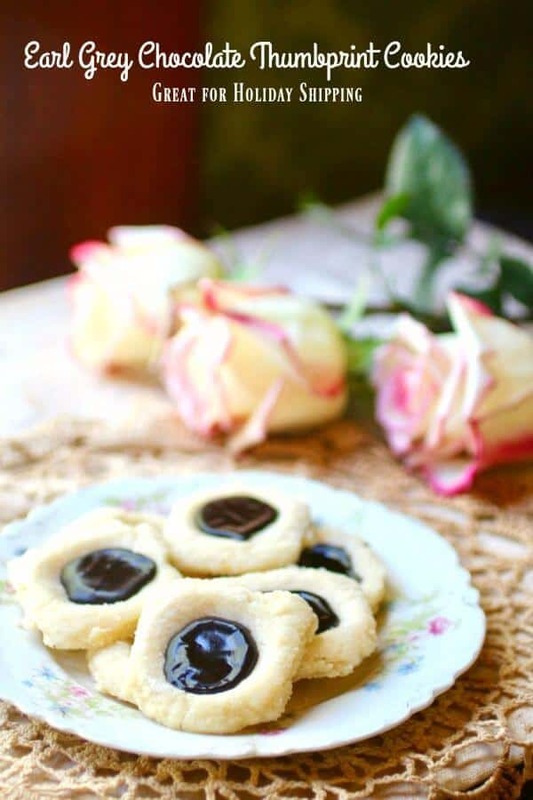 Buttery sugar cookies with a dark chocolate filling, these traditional Brown Eyed Susans or chocolate Thumbprints are as delicious in 2016 as they were in 1936. They may even be older than that. These cookies freeze well and ship well if they are packed carefully. Beat the butter, vanilla, and sugar until light and fluffy. Blend in the flour and salt. Shape teaspoons of dough into balls and roll in sugar. You can use colored sugar for the holidays. Place on a silpat covered baking sheet. Press thumb down in the dough to create an indentation. Remove from oven and press the center down again if it needs it. Combine confectioner's sugar and cocoa. Add the hot tea and vanilla - stir until smooth. Fill the depression in each cookie with the chocolate mixture. Let the filling harden before storing. I love the sound of these cookies! Earl Grey tea is one of my favorite afternoon teas! What a fun flavor for a thumbprint cookie! These cookies are so pretty and sound absolutely delicious. I just love how much variety for all of this marvelous chocolate! 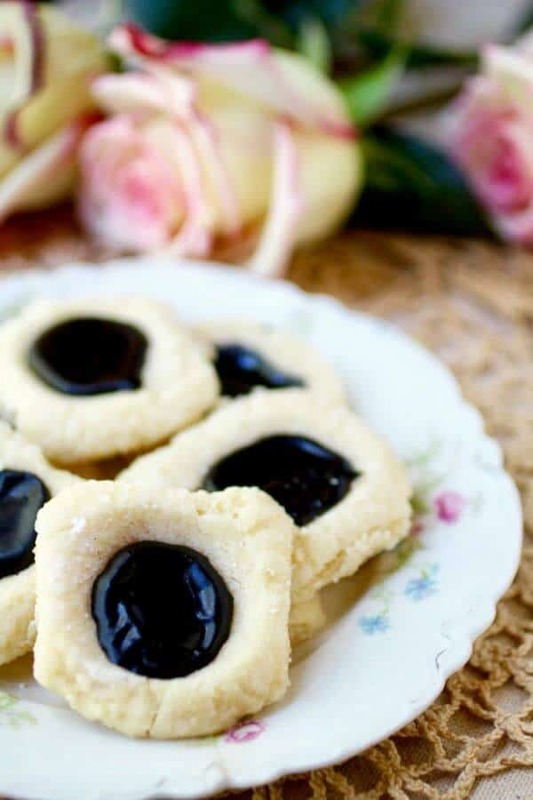 My grandma used to make the best thumbprint cookies! Just looking at your beautiful pictures took me waaaaaaaay back… Yum! Issn’t it awesome how some foods just pull us right back into happy memories? I’m so glad you like them! I am so glad you were able to make it through the tough times. I am also glad you shared this recipe. I love thumbprint cookies. Thanks! You just have to be tougher than your challenges!